Our typical shojo manga these days mostly have one thing in common: some sort of magic. Whether it be turning into the animals of the zodiac, using brooches to transform into heroes of the galaxy, or witches after a teenage boy’s “lineage”, you don’t see much originality when you go to the bookstore looking for shojo manga. However, while at AnimeNEXT in the dealer’s room desperately looking for a new manga to distract myself with, I stumbled across a manga that looked like a spinoff of Peach Girl. 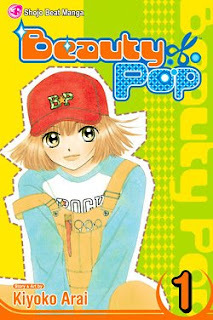 Distributed by Shojo Beat, Beauty Pop is anything but. The story revolves around Kiri Koshiba, a seemingly average high-school student in modern-day Japan. At her school, an organization of three boys known as the “Scissors Project,” led by pretty-boy Shogo Narumi, aims to make girls beautiful by giving them makeovers in front of the entire school. The goal of these makeovers is so these girls will end up making the boy of their dreams fall in love with them. They’re kind of a big deal. Kiri, however, a gifted hairstylist, thinks the Scissors Project is ridiculous and overhyped, though she secretly gives makeovers to those rejected by the Scissors Project. At first glance, it admittedly sounds pretty absurd. Who wants to read a manga about a bunch of metro girly-boys giving makeovers to girls to make them look pretty, while still trying to maintain their masculinity? Believe it or not, throughout my reading of this manga, I never once questioned the masculinity of the boys in the Scissors Project. It’s very difficult to write characters who participate in feminine activities without getting questions of shonen-ai in response. However, Kiyoko Arai, who writes the story and draws art for this manga, manages to do just that, though I personally didn’t really mind the very pretty metrosexual boys running around. That's because in truth, Beauty Pop is actually fascinating, original, and very funny. It’s a romantic comedy at heart, though the romance only starts to shine around the second volume. The art, while not outstanding, is very typical of shojo: big eyes, skinny boys, you get the idea.